Recently I was lucky enough to do a workshop with Mary Transom www.marytransom.co.nz from New Zealand. Here I learnt some new applique techniques about preparing whole units of embroidered flowers before machining them to the surface of a quilt. Naturally, I went home all ‘fired up’ and wanting to work on my new project – and naturally, ‘life’ got in the way. If only I could have a week – or even one whole day after a workshop to be able to focus on completing my new quilt, or mastering the technique. What I need is 25 hours per day!! I guess that is something all patchworkers wish for occasionally – especially when it comes to trying to fit into a busy day their quilting and patchwork. So I must confess I haven’t done much more on my quilt from when I did the workshop. 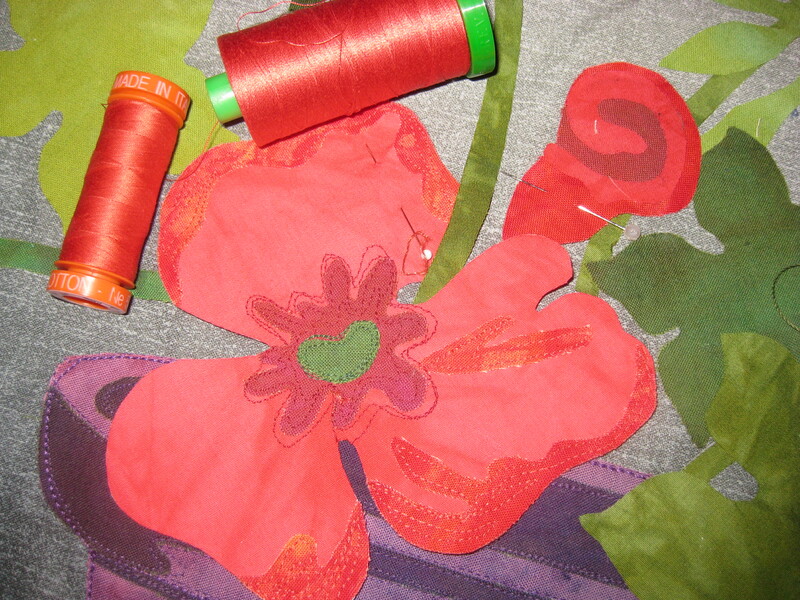 I have started to machine down the geranium leaves before adding the embroidered flowers. Mary appliques with a small zig zag, a buttonhole stitch or even a satin stitch. I wanted to try doing a ‘raw edged’ applique using the Ne 12 thread. 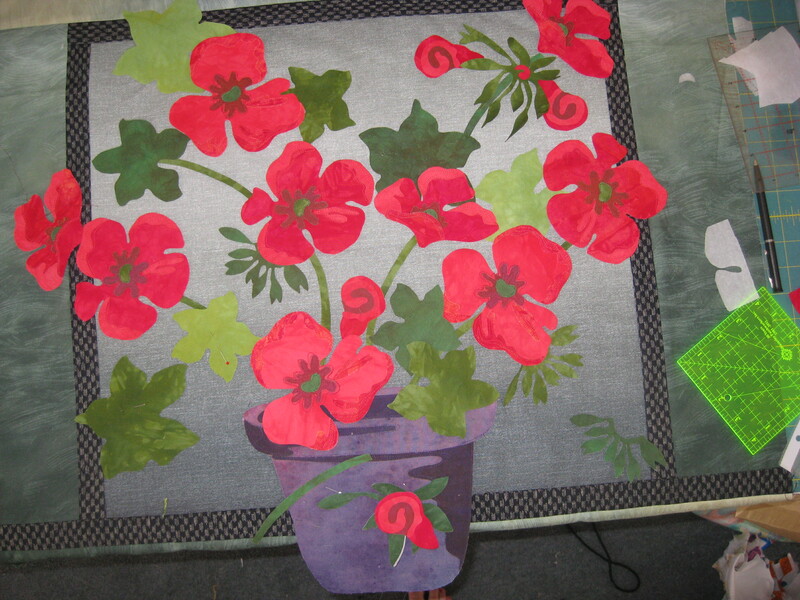 It was interesting selecting a colour to use, as when I laid the one I chose across the red coloured petals, the thread ” changed” colour in the ‘rich’ red petal and again in the softer red petal. 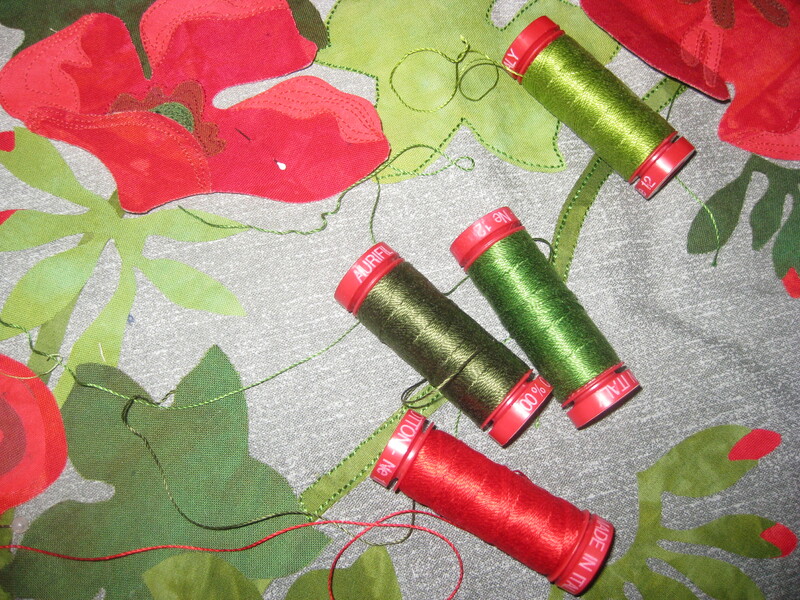 It meant I could use one Ne12 thread colour for most of the flowers. I may use the lighter weight Ne 28 or even the Ne 40 to machine embroider the leaf veins, but that decision will wait until I get all the leaves put in place. I just wish I had a few more hours in the day to concentrate on my pot of geraniums! This month I have decided to start a new project. I wanted to have something simple and easy to take along in the car or the train. Preparation is the key to a portable project so I decided on a hand appliqué block. I will be needle turning my appliqué pieces. 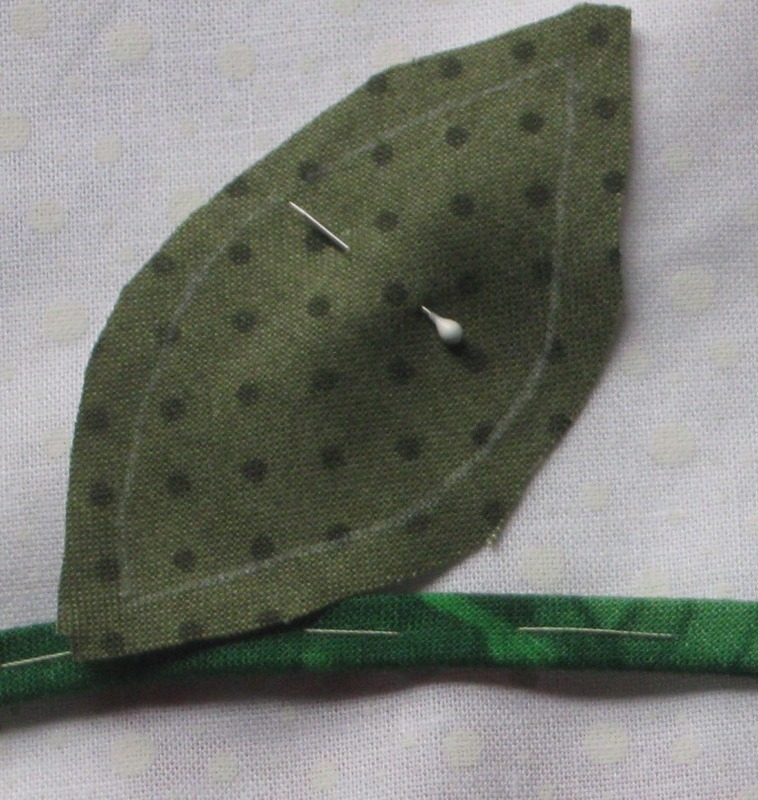 I use a Sewline Marking Pencil to mark around my appliqué shapes and then use my appliqué needle to turn under the seam allowances of the appliqué fabric. The piece is then stitched onto the background fabric using a blind stitch. 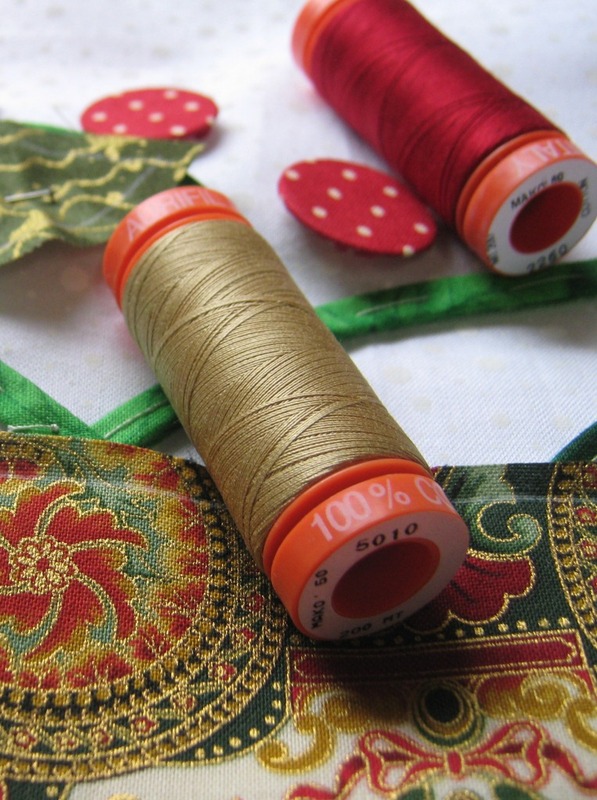 For fine, elegant stitching, use a strong needle with a sharp point and Aurifil Cotton Mako 50wt. thread. Your appliqué tools can be found at www.alwaysquilting.com.au. 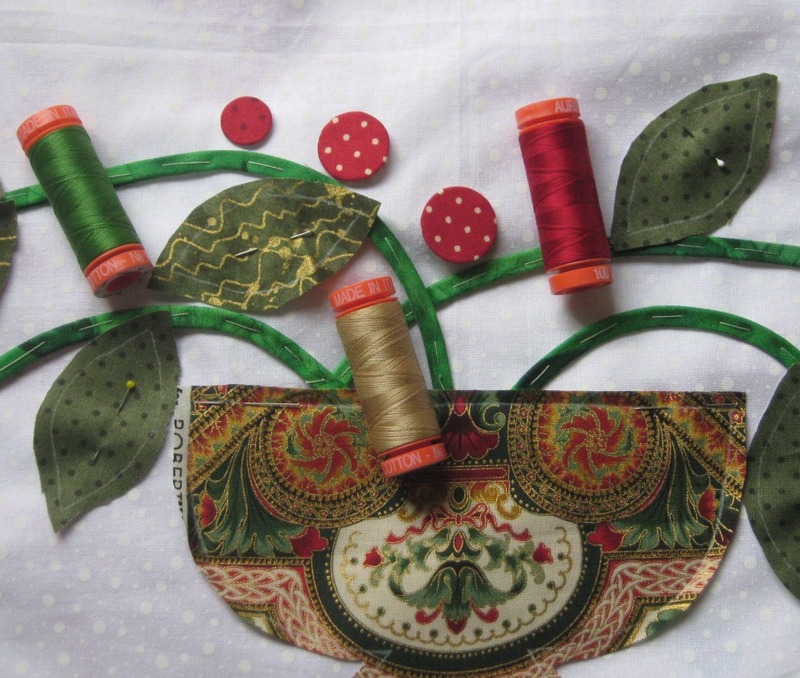 The Aurifil Cotton Mako 50wt thread is perfect for appliqué. I am using a golden coloured thread for a patterned fabric and the stitches just disappear into the seam giving me the smooth edge I strive for when hand appliquéing. I can always match my fabrics with 252 colours to choose from. You can watch me appliqué on this short video!